The Amazing Recycled Crafts Contest. I can hardly think of a better way to spend a rainy afternoon then cruising the recycling bin and helping the kids create fun projects. Even better, your craft could win an Energy Star approved Samsung 46″ HDTV or an Apple MacBook. If you aren’t feeling the creative juices, check out all the great ideas on FamilyFun.com for making recycled crafts. In addition to craft ideas, visit the “Green A Little, Save A Lot” page for green tips, advice and information geared to adults. 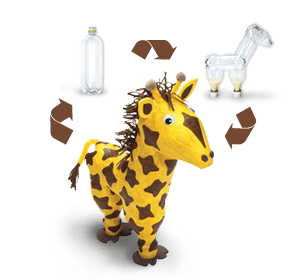 Isn’t the bottle giraffe super cute? Even looking at the photo, I’m shocked and amazed that someone came up with this adorable little guy. (Photo from FamilyFun.com). Our most creative, recycled craft was to create decoupage canisters… guess my work is cut out for me! I’m on a mission to see what our family can come up with… maybe we will have something photo worthy to enter into the contest (which runs through April 30th). I can’t wait to hear and see all your ideas (leave comments and blog links, PLEASE!). Remember, the contest is over there… not here. My son and I created a “junk robot” just for fun on a sick day home from school. We found the contest and entered our creation. My 5 year old son is very excited about the contest if you could please vote for his creation, we would appreciate it!